Since the company refuses to recall its ‘USSR’ product line and publicly apologize for launching it in the first place, UCMC publishes its twenty-first protest visual. On May 24, 1964, the Library of the Ukrainian Academy of Sciences suffered a huge fire resulting from an arson committed by Viktor Podruzhalsky, one of the employees. Almost 10% of all materials – about 600,000 books, manuscripts, chronicles, and works of art – were burned to ashes including all documents and other materials pertaining to the period of 1918 – 1930. The fire destroyed the collection of materials in Ukrainian studies and the department of books printed before the late seventeenth century. The burned department of manuscripts was of invaluable importance: it contained very rare memorials of original Ukrainian writings of X century, “Universals” of Khmelnytskyi and other Hetmans, and historical documents of XVI, XVII and XVIII centuries. In it were also deposited manuscripts, correspondence and other personal documents of Ukrainian classics like Skovoroda, Gogol, Marko Vovchok, Lesia Ukrainka, Panteleimon Kulish, and others. 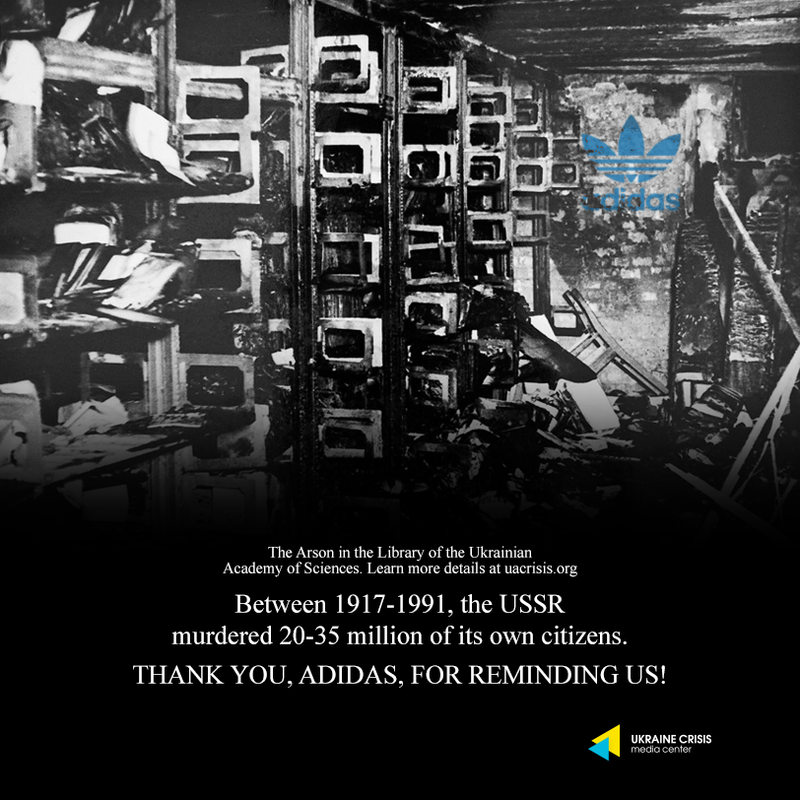 The whole story left a strong suspicion among the population that the fire was a premeditated arson organized by Soviet authorities. This is just one example of what the USSR really was. Throughout 70 years of Soviet rule, the populations of Ukrainians, Crimean Tatars, Lithuanians, Latvians, Estonians, Georgians, Armenians, Moldovans, Kazakhs, and many other ethnicities were decimated, displaced, killed by artificial famine, tortured, persecuted, their lives, cultures, and livelihoods destroyed. We demand that the company recalls these products immediately from its online/offline stores and distribution centers and issues an unequivocal apology to all those affected by this morally reprehensible sales tactic.